Mobius is in India to explore regulatory issues before his new EM fund enters the Indian market. 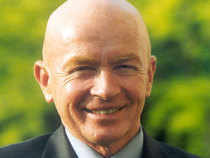 NEW DELHI: Emerging market guru Mark Mobiusâ love for India doesn't stop at stocks. Mobius, often referred to as the Pied Piper of emerging markets (EMs), has a liking for Bollywood movies, Baahubali and Padmaavat in particular! Directed by S S Rajamouli, the two Baahubali franchise movies -- Baahubali: The Beginning and Baahubali: The Conclusion -- are among the highest grossing Indian films overseas. So is Sanjay Leela Bhansali's Padmaavat. Known for working out at his gym twice a day to keep himself fit, Mobius is in India to explore regulatory issues before his new EM fund enters the Indian market. Addressing the eighth edition of Morningstar investment conference in Mumbai today, he called on investors not to follow the crowd and stop having obsession with the index performance.